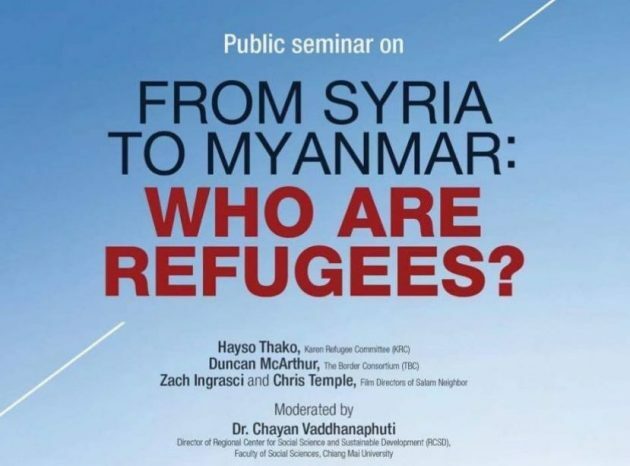 Over 100,000 refugees live in nine refugee camps along the Thai-Burma border while over 3,000 Karen IDPs remain at the Ei Tu Hta temporary shelter and over 6,000 Shan IDPs are residing in camps along the Thai-Shan border, according to refugee activists. They added that after the Myanmar government and ethnic armed organizations signed ceasefire agreements and started implementing the peace process beginning in 2011, pressure has escalated for refugees and IDPs to return to their homes. While international aid organizations, swamped with other, fresher crises, are forced to dedicate resources elsewhere, the Myanmar refugees say their needs are increasingly going unmet, while lack of livelihoods in their original villages, and in some cases the threat of landmines and fresh conflict, prevents an easy return. “The international community does not know the real situation of our refugees. I’m glad to have the chance to explain how the issues occurring at the Karen refugee camps are directly related to Myanmar politics,” said Saw Hayso Thako, an education officer with the Karen Refugee Committee.